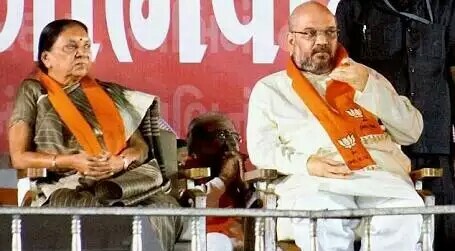 Amit Shah's choice for Gandhinagar: Will ex-CM Anandiben Patel "play" a spoiler? When Prime Minister Narendra Modi chose Amit Shah as a replacement for BJP veteran LK Advani from the Gandhinagar Lok Sabha constituency for the 2019 general elections, it was more to recreate the Atal-Advani visual imagery in governance than anything else. Modi is a great one for symbolisms as image building tools . By replacing Advani with BJP party chief Amit Shah, the obvious message sought to be conveyed is that the seat has been given to the national party president as a mark of respect to the veteran leader who held it for seven terms. The add-on is that after completion of his second term as party chief, Shah may find place in the Cabinet as a number two if BJP comes back to power at the Centre. The most enduring image that still moves the Jan Sangh-BJP imagery is the Atal Bihari Vajpayee-LK Advani duo. Both images off course are a take-off from the original one in the first government of independent India -- Prime Minister Jawaharlal Nehru to his deputy Sardar Vallabhbhai Patel. It would not be too far-fetched to see Modi and Shah trying to recreate the same. Modi trusts Shah implicitly and few others this way. The combination came to be forged during Modi’s chief ministerial days with Shah playing a crucial role exercising his chief’s proxy power handling the crucial position of minister of state for home (Modi himself kept the home portfolio). He even went to jail to shield his boss. Imagery apart,'Shah looked after Advani’s Lok Sabha campaign in the earlier years. Thus Shah knows the constituency like the back of his hand. Advani was the sitting MP from Gandhinagar from 1991 till 2019 barring couple of years between 1996 and 1998. Under Advani, it came to be known as the safest seat for BJP, despite the fact that it stretched from the state capital, Gandhinagar, through a flank of Ahmedabad to its southern extremity. The seat originally belonged to later day BJP rebel Shankersinh Vaghela who had gifted it to Advani personally assuring his election. That Advani cast his lot with Modi when it came to choosing between the two is a different matter altogether, though it substantially changed the course of Gujarat and Indian politics later, leading to his own (Advani’s) marginalization! It was in the last Lok Sabha election of 2014 helmed by Modi which brought him to power at the Centre that BJP scored a perfect 26 bagging all the seats from Gujarat. In the aftermath of Advani, despite the veteran having lost relevance after the rise of Modi, things will not be all that easy for BJP in Gujarat, more so in Gandhinagar constituency . The party remained united for Advani, and the traditional rivalry between the Shah camp and that of former chief minister Anandiben Patel is bound to surface again, more so since Shah is himself the candidate. In fact, Anandiben Patel was in Ahmedabad for a week during the period that the state BJP set-up was evaluating names of likely candidates from Gujarat. Shah’s candidature also makes it abundantly clear that despite the boast of bagging all the 26 seats, the leadership is a worried lot. If the 2017 Assembly elections are taken as the yardstick, the BJP trailed in 8 Lok Sabha seats. These were Banaskantha, Sabarkantha, Patan and Mehsana in north Gujarat; Junagadh, Amreli and Surendranagar in Saurashtra region and Anand in central Gujarat. An upbeat Congress, after the last Assembly elections, is determined to take the battle into the rival camp. Rahul Gandhi started his election campaign from Dharampur in South Gujarat --the venue successfully chosen by Indira Gandhi, Rajiv Gandhi and Sonia Gandhi for the return of the Congress to power. More recently, it held the party’s Congress Working Committee meet in Ahmedabad where Priyanka Gandhi made her first political speech at a rally, where Patidar Anamat Andolan Samiti (PAAS) leader Hardik Patel formally joined the party. This is the sole reason that the ruling party weaned away six congress legislators with Cabinet rank to two of them and an minister of state to another, besides assorted inducements for the remaining with an eye to gaining hold of caste vote banks. Despite all these, the support of the Patidar vote bank still continues to elude BJP, the Prime Minister’s own intervention notwithstanding. As things stand, 2019 is not 2014 and there has been an erosion in the BJP votebank with Congress making major gains in the 2017 State Assembly elections. Shah’s boast of bagging 150 seats went abegging and BJP was down to 99, its lowest ever score after Modi took charge in 2001, with the Congress taking it’s tally to 77 in a total house of 182. Despite the spate of induced desertions from the Congress through the lollipop of ministerial berths that has brought its tally down to 71, the fact is that Congress is expected to fare better than last time when it had touched rock bottom. This is also, in fair measure, due to the internal dissensions within the BJP wherein loyal leaders have been sidelined to reward turncoats from the Congress with plum posts. It is common knowledge that the traditional Shah-Patel group rivalries, as well as those created by the turncoats entry is expected to make things lot tougher for Shah, though he may ultimately prevail. In 2014 Advani had won the seat with a margin of 4,83,121 votes. That is a fairly tall order for someone wanting to step into veteran Advani’s illustrious and time-worn shoes!